Robert R. Perkinson; Arthur E. Jongsma Jr. This completely updated guide offers new treatment planning language rooted in evidence based care, as increasingly required by many insurers and funding agencies. Presenting new DSM-5 diagnostic recommendations, this resource covers 40 of the most commonly seen presenting problems including substance abuse, gambling, eating disorders, impulsivity, social anxiety, psychosis, ADHD, and borderline traits. The book contains over 1,000 pre-written treatment goals, objectives, and interventions organized around main presenting problems for quick reference and easy adaptation. 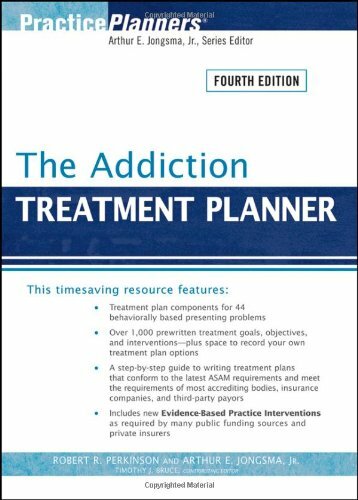 The Addiction Treatment Planner, Fourth Edition provides all the elements necessary to quickly and easily develop formal treatment plans that satisfy the demands of HMOs, managed care companies, third-party payors, and state and federal agencies.